Running a website can be a big job, which means any tools that help you to simplify your workflow are invaluable. 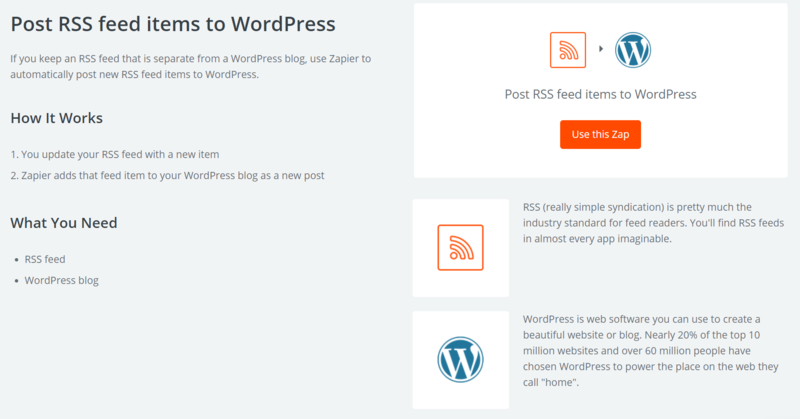 Enter Zapier – a unique online service that helps you automate many common WordPress tasks. 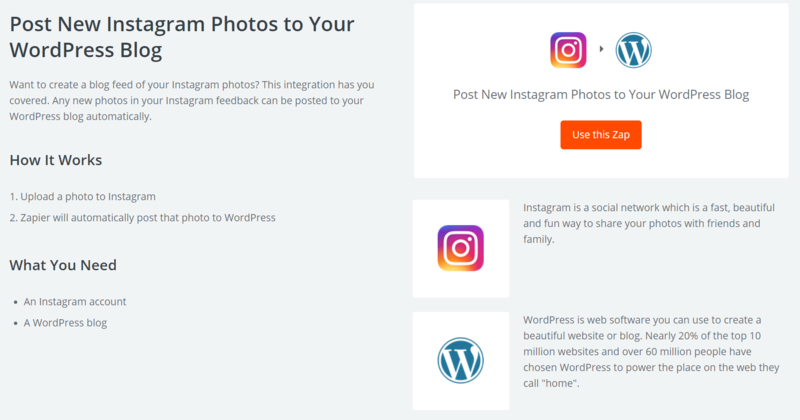 You can use it to integrate your website with popular social networks and other tools, enabling you to combine and automate tasks such as posting your blog entries to social media, backing up your drafts, or even adding new content to your calendar. Zapier is a service that enables you to automate workflows across common apps and tasks, resulting in the creation of ‘Zaps’. This can include importing content from other platforms, posting RSS feed items, sharing survey responses, and much more. If you run into any issues while creating a Zap, you can check out Zapier’s help center, which should set you back on the right path. Facebook is an excellent way to communicate with your audience and court new readers. However, you may not always have time to create unique content for both your site and your Facebook account. 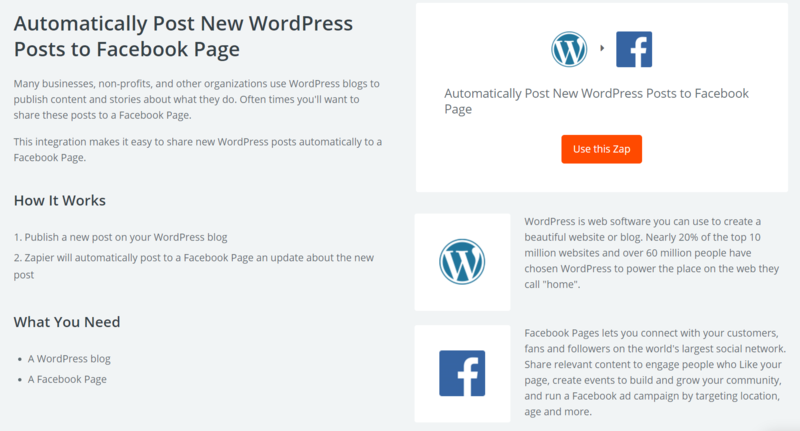 This Zap offers a solution, by making it possible to share your new WordPress posts automatically to your Facebook page. This Zap is designed to share your recent posts on Twitter (as the name suggests). Twitter is an ideal platform for getting your content out to as many readers as possible right away, yet logging on and posting a link to each new post can be inconvenient. Along with sharing your WordPress posts on social media sites, it’s also worth adding your regular social media content to your blog too. Readers will appreciate the variety that comes from posting more than just text-based entries. For example, you can use a Zap to post your Instagram photos to your blog. If you run a YouTube channel in addition to your blog, you may be interested in a simple way to promote your new videos. 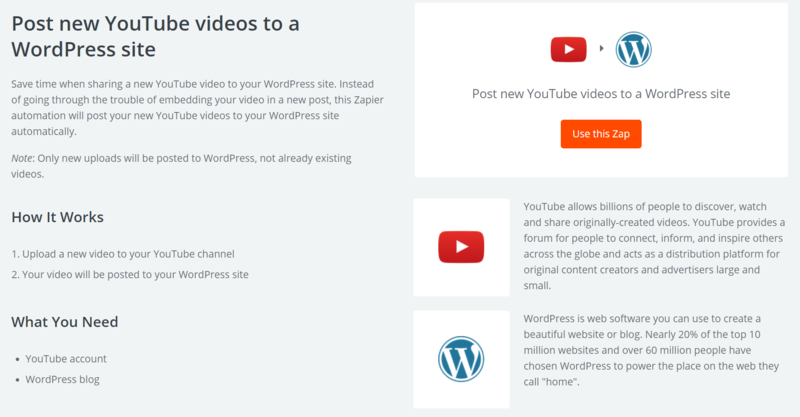 With this Zap, you can ensure that each video you post to YouTube will also be uploaded to your blog, without the need for you to create a post and embed the file manually. There are a number of ways you can use an RSS feed in conjunction with your blog. You can set up a feed of other blogs your readers might be interested in, or collate your own content from different platforms. 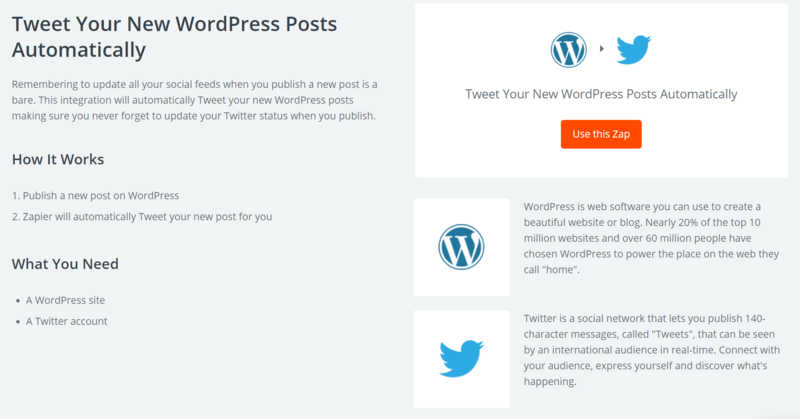 Either way, you can then use this Zap to share any new feed items on your blog. If you’re not familiar with Buffer, it’s a handy app that enables you to schedule content to be posted on Twitter, Facebook, and/or LinkedIn. This means you can spread out your updates so they will be released at regular intervals. With Zapier, you can also set your ‘Buffered’ items to post automatically to your WordPress blog. SurveyMonkey is a free tool that lets you create custom surveys and questionnaires. You can use surveys to gather all kinds of feedback from your readers – topics they’d like you to cover, or their reactions to your content, for example. If you want to share the results with your readers, you can do so easily with a Zap. At first, you’ll need to enter your SurveyMonkey credentials, then tell the Zap which survey you’d like it to follow. Optionally, you can also define a particular ‘collector’ for it to watch. 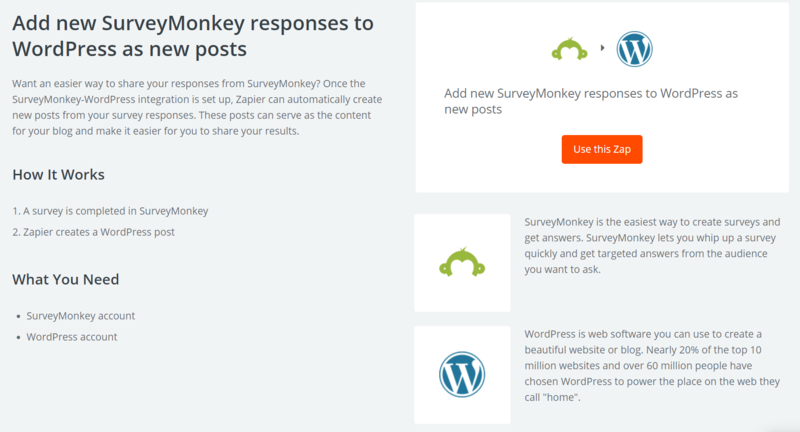 As with other Zaps, you can also configure the way the survey results will appear on your blog. It’s fairly common for bloggers to draft posts in a standalone text editor before bringing them over to WordPress. However, the process of transferring a text document to the back end of your blog can be cumbersome. 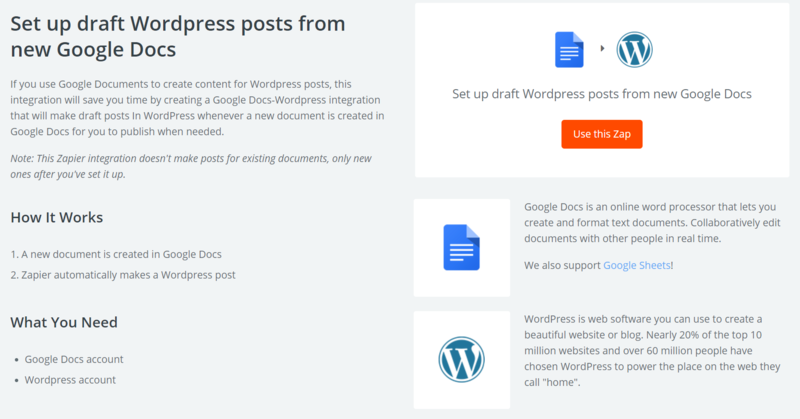 If you use Google Docs to create your WordPress posts, you can streamline the process with this particular Zap. If you create a lot of posts (or have multiple authors), it can be crucial to maintain a calendar to keep track of everything. 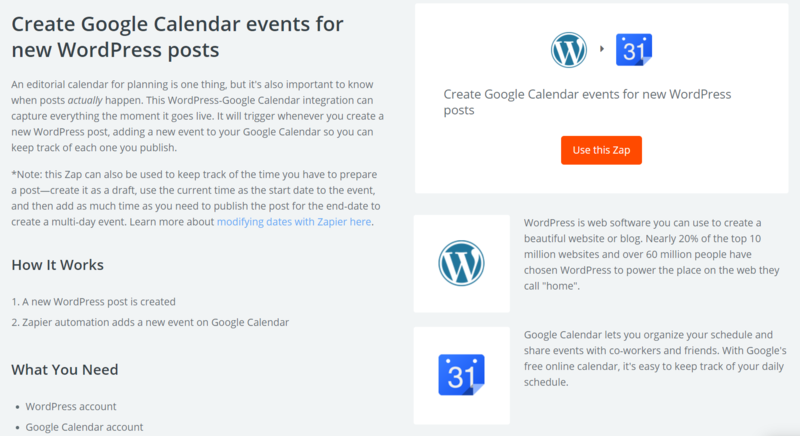 That’s why this Zap will integrate your WordPress blog with Google Calendar. It will automatically add each new post to your calendar, so you know what has been published and when. There’s a good chance you already back up your blog, but what about its individual posts? Disaster can strike at any time, and you don’t want to lose valuable content. 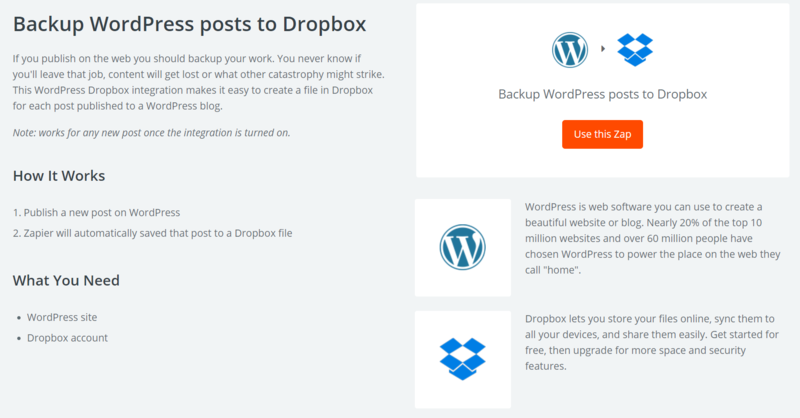 With this simple Zap, you can back up your WordPress blog posts to Dropbox, so you’ll have them somewhere safe just in case. Running a blog can be a massive job – especially if you post a lot of content or have multiple authors. Automating common, recurring tasks is a smart way to stay on top of everything. With Zapier, you can create Zaps that handle some of your site’s busywork, which streamlines your workflow and gives you more time to focus on the bigger picture. To get started with Zapier, simply create an account and start looking for the Zaps you need. There are Zaps that can help with many of the tasks you carry out regularly, such as posting new content onto Faceboook, adding items from your RSS feed to your blog, importing Google Docs files to your back end, backing up your posts, and much more. Each one is simple to set up and activate, and will do its job automatically without any further input from you. https://ifttt.com/ is free and can make beautiful things too. Hi Jeremy and Misha, thanks for commenting! Check out this article for a comprehensive comparison: https://www.process.st/zapier-vs-ifttt/.